If you're a woman who feels that the car buying process can be more than a little intimidating at times, you're in good company. Recent studies suggest that upwards of 50% of all female car buyers feel they are more likely to be treated unfairly when they do business with an automotive dealer, unless a male friend or family member accompanies them, that is. At Hatfield Hyundai, of course, this is never something you need worry about. That's because all our sales associates-regardless of their gender-are trained to make a genuine connection with each customer, to ask questions and listen to your needs, and to treat everyone who walks onto the Hatfield Hyundai lot with respect and courtesy. But in our efforts to provide you with the best car buying experience possible, we're proud to feature knowledgeable and friendly saleswomen on staff to serve you, female employees that always have your unique and very special interests in mind. At Hatfield Hyundai, it's their job to help ease your anxiety when it comes to buying or servicing a car, or even securing a car loan. Here at Hatfield Hyundai, the many women we employ fully understand the special needs of you and your family. After all, they have families of their own. They also know the difficulties of juggling career, family, and the endless daily challenges all modern women face, such as managing a household budget. This means that our female associates understand the importance of saving you money on the perfect new Hyundai, Certified Pre-Owned Hyundai or used vehicle. 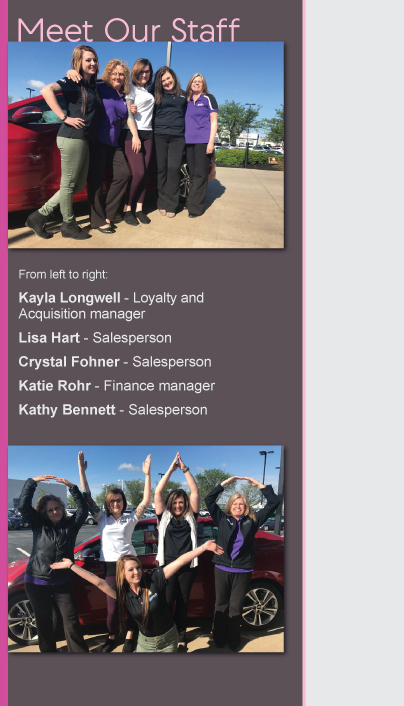 We utilize female associates in several different departments throughout our dealership, and we would like to invite you to come and get to know them all.